SMWDataValue implements the handling of small sets of property-value pairs. 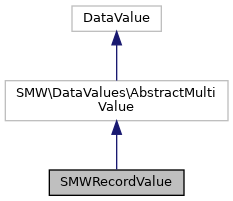 The declaration of Records in SMW uses the order of values to encode the property that should be used, so the user only needs to enter a list of values. Internally, however, the property-value assignments are not stored with a particular order; they will only be ordered for display, following the declaration. This is why it is not supported to have Records using the same property for more than one value. The class uses DIContainer objects to return its inner state. See the documentation for DIContainer for details on how this "pseudo" data encapsulated many property assignments. Such data is stored internally like a page with various property-value assignments. Indeed, record values can be created from DIWikiPage objects (the missing information will be fetched from the store). Return the array (list) of properties that the individual entries of this datatype consist of. Make sure that the content is reset in this case.